This Slow Cooker Guinness Shredded Beef couldn’t be easier to make. 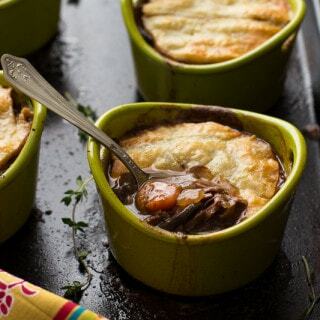 It’s infused with the bold flavor of Guinness and is melt-in-your-mouth tender. Beef is so much sexier with the addition of booze. Don’t you agree? This stout-infused shredded beef is super tender, melt-in-your-mouth delicious, and incredibly flavorful. And, thanks to the slow cooker, this hunk of beef is stupid easy to make. Honestly, I’d be lost without my beloved slow cooker. Setting and forgetting is the best kind of cooking! Since St. Patrick’s Day is quickly approaching, I felt it only right to infuse the meaty, perfectly marbled chuck roast I picked up from my butcher last week with the rich, bold flavor of my favorite Irish stout. The dark Guinness Extra Stout tenderizes and breaks down the roast as it cooks. After 8 hours of slow roasting in the stout mixture, the roast is ready to eat–well, almost. After you gently remove the roast from the slow cooker and onto a cutting board, use two forks to gently shred the roast. I like to transfer the shredded beef to a platter and spoon the stout and onion mixture over the meat to keep it moist and juicy. On Thursday, I’m going to show you how to turn this shredded beef into Irish tacos, so stay tuned! Tender, juicy shredded beef with the rich, bold flavor of stout beer. In a small bowl, mix together garlic powder, onion powder, paprika, salt and pepper. Sprinkle the spice mixture evenly over all sides of the roast. Add the beer, worcestershire sauce, and sliced onions in the bottom of a slow cooker. Place the roast on top of the onions. Cook on low for 8 hours. Gently remove the roast from the slow cooker and onto a cutting board. Using two forks, shred the beef. Place the shredded beef on a platter and spoon over the beer and onion mixture.